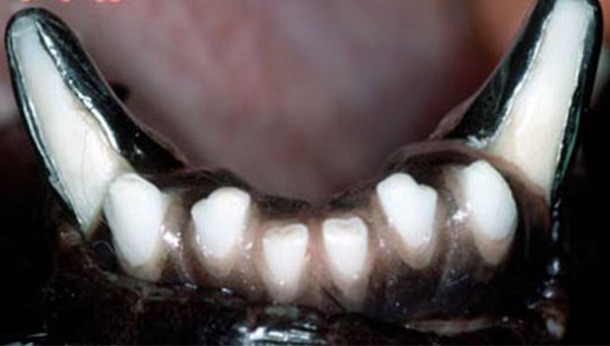 Working dogs – mainly Police, Military, Search & Rescue and Schutzhund dogs – have been having crowns fitted to fractured teeth for some time. 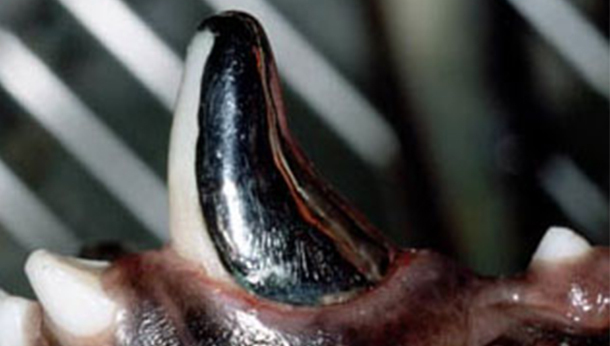 These animals are thought to require the use of a full length canine teeth to contunue working. We will occasionally recommend the use of a crown if it is the only way of protecting a vulnerable tooth from further fracture damage. Most of the teeth we crown have already been root filled. For full metal crowns we use Talladium Tilite as we feel it provides excellent strength, superior bonding to the tooth and as good an appearance as is possible for a metal crown. They are strong and durable but they do make the dog look fierce! White crowns are possible in some circumstances - see below. They look more natural but probably do not have the strength yet to be used in canine or carnassial teeth. Technology improves all the time and we monitor this. One major restriction is the need for at least 4mm of tooth to attach the crown to. If we have less than this it can make keeping the crown on a real challenge. Crown fracture left lower canine. Temporary crown placed for 2 weeks. Thie left lower canine shown above was badly fractured but the pulp was not exposed. A full metal crown will protect it from further damage and the subsequent need for root canal treatment. The tooth is "prepped" to accept a crown so it is no wider than the previously undamaged tooth. Impressions are taken for our lab to fabricate a custom crown. In the meantime a temporary crown is placed to protect it for the two weeks in between visits. The Talladium tilite crowns are delivered back to us on custom stone models of the original impressions and are ready to place. The temporary crown is removed and the tooth cleaned. The crown is trial fitted to ensure it covers the prepped tooth without any defects and also to ensure the mouth will close without any abnormal contact with the upper teeth. Gold alloy crown ready to fit to an upper carnassial. Some vet dentists advocate the use of a post to improve retention. Whilst this helps it can also increase the strength of the crown to the point where, under hard biting stress, the dog may severely fracture the remaining crown or even pull the whole tooth out of the socket - rather than just lose the crown. Crowns can be replaced but teeth can't. 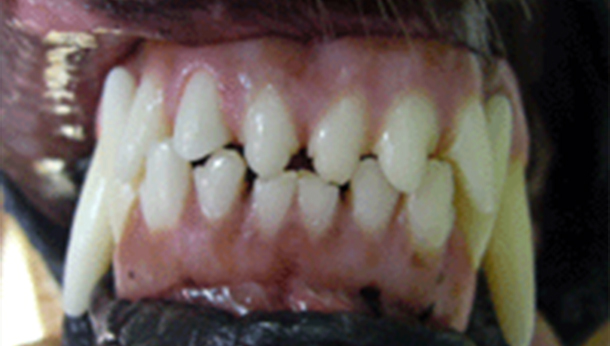 Crowns undoubtedly provide better protection for big and active dogs than other dental restorative materials. If the accident that caused the tooth fracture is a one-off a crown works very well. In the last few years we have been able to get white crowns made from glass ceramics. E-MAX crowns are milled from a single block of lithium disilicate ceramic and appear to bond strongly to an etched tooth surface. 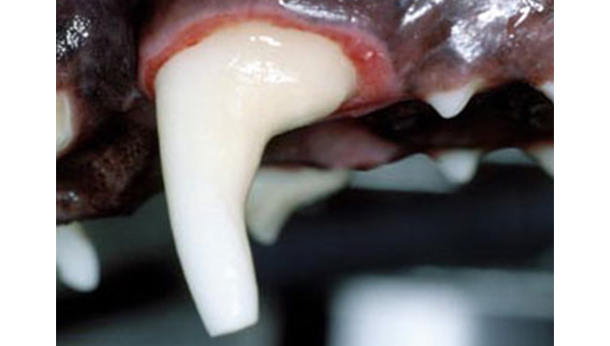 They are considered to be very tough, durable and allow opaque colours which, in dogs, can be important as their teeth are usually very white requiring bleached shades. Because the thought is that they are not as strong as full metal crowns, up to now we have not used them on canine or carnassial teeth. There has been a recent trend to do so in the USA so we are watching developments with interest. Fractured upper right incisor (202) following root canal work. Tooth now stable but not good enought for show purposes. Same tooth with zirconium crown placed. Another application for the protection offered by crown is for teeth damaged by heavy abrasion such as Cage Biter Syndrome (CBS). This syndrome is common in Police and other workiing dogs (e.g. guard dogs) that spend time in cages during work. 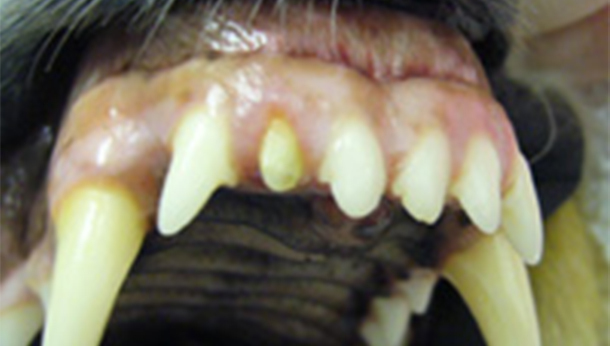 They grip the cage bar or fence wire with their canine teeth and rub up and down. It is cosidered a behavioual vice and is hard to stop. The result is heavily worn canine teeth, mainly on the distal aspect, and eventual fracture and pulp exposure due to the weakness. Crown damaged by Cage Biter Syndrome. Partial onlay to protect tooth from fracture. Metal onlays can help protect the teeth before they fracture. The worst case of this we saw was an explosive sniffer dog that was bound for the Falkland Islands with the RAF. In his two year tour of duty he managed to wear through the titanium crowns to the absolute disbelief of the dental laboratory!